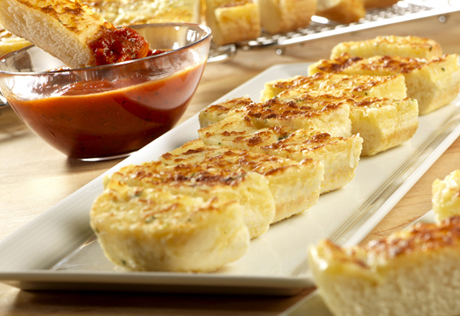 Aromatic garlic bread, topped with mozzarella cheese, is served with a rich Italian tomato sauce for dipping. Bake for 10 minutes or until the bread is heated through. Cut each bread half into 12 (1-inch) slices, making 24 in all. Serve with the sauce for dipping.